We were recently co-facilitating a coaching workshop for a group of managers – developing their skills and knowledge in coaching in the workplace using the GROW model of coaching. Early on in the workshop a couple of participants raised some doubts as to how coaching would work in their organisation: We work in a fast paced environment where our staff need quick answers to questions; Numerous times throughout the day my staff come to ask me what we should do about this or that and expect an answer – I’m not sure we really have time to ‘do coaching’. Well, that really stopped Paul in his tracks! He said he suddenly felt a greater sense of responsibility for his work and to not assume that the manager would fix any deficiencies in the work. Paul took the work papers back and did a thorough review of his own work before giving it back to the manager. 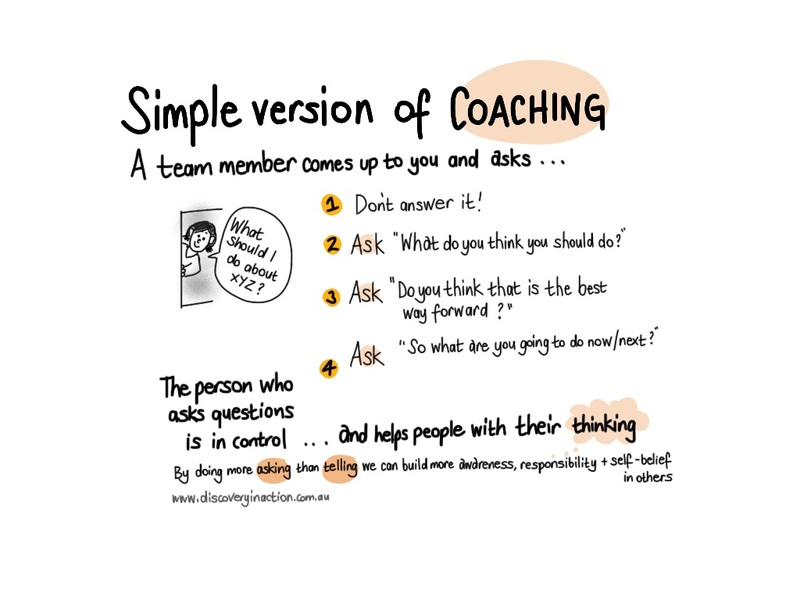 Its only taken a moment or two but it is coaching – you are developing them; increasing their capacity to make decisions; building their self-belief; and pushing them to take responsibility and ownership for their choices. Over time you should also reap the benefits – your time is freed up because they are dealing with questions and issues themselves and becoming more capable. We’ve developed a simple one-page info-visual that captures this idea. Click on the visual above to print yourself a copy. Click here to see our other blogs on coaching and the GROW model, and here if you are interested in our Coaching Skills program.